Ron and Maureen Caruso have lived in their Williston house for 29 years. Last year, Maureen decided she wanted a decorative pond in their sloped backyard. A depressed area near the end of the slope tended to retain water anyway; the house’s perimeter drain emptied into it, and it bordered an asphalt sidewalk and road. “It was already swampy,” Ron Caruso recalls, standing on his lawn. One of the Carusos’ neighbors happened to be Rebecca Tharp, district manager at the Winooski Natural Resources Conservation District. Tharp had noticed how, during rain events, “the water was getting funneled right to the paved walkway” and, from there, directly into the wetlands of Allen Brook, a Winooski River tributary that’s on Vermont’s list of impaired waters for sediment and E. coli limits. “In the summer, it was fast, hot and picked up a lot of water. It was like a river,” Tharp recalls. So, instead of a pond, Tharp encouraged the Carusos to put in a rain garden. Such a bowl-shaped garden filters stormwater runoff from the roofs, driveways, compacted lawns and other impervious surfaces of developed land. 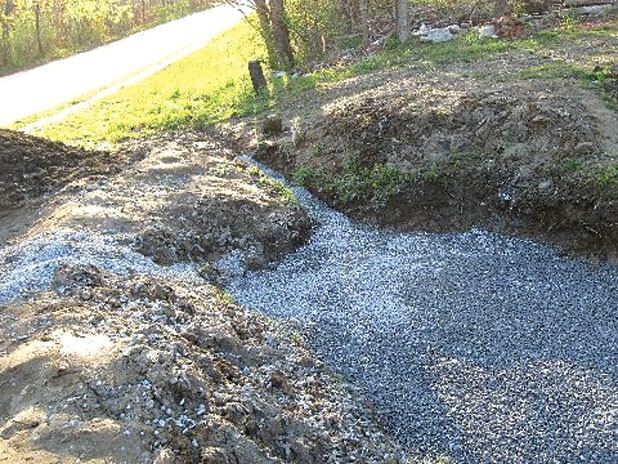 Using the free Vermont Rain Garden Manual — produced by WNRCD in conjunction with the University of Vermont’s Extension Service and Lake Champlain Sea Grant — the Carusos calculated the amount of runoff their property generated, given the square footage of its impervious surfaces. Tharp, her WNRCD colleague Jessica Andreoletti and Justin Kenney, the green infrastructure coordinator at the Vermont Department of Environmental Conversation, all visited to help with soil testing, siting and sizing. Ron Caruso dug up the problem area with his shovel and laid in gravel, landscaping fabric, sand and topsoil. Maureen chose plants with absorbent root systems from the manual’s recommended list, which includes 85 different perennials, among other suggestions. Aiming to attract birds and other winged populations, she selected asters, coneflowers, bee balm, butterfly bushes and two kinds of tall, elegant switchgrass. Now in its second spring, the rain garden has had a transformative effect, Maureen Caruso reports. “All the area around it is completely dry, and before that you had to wear boots. It’s phenomenal that it’s working so well.” Now, rainwater filters through the garden down to the groundwater system instead of into Allen Brook. 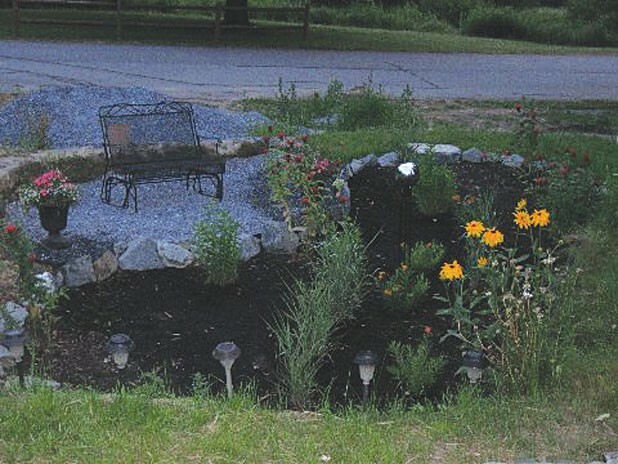 About a month after the materials had been delivered, the Carusos discovered another bonus of creating a rain garden: They could receive up to $250 of reimbursement from Let It Rain, a stormwater-management program run by WNRCD. After sending in receipts and a photo log of the installation process, they were granted the maximum amount. 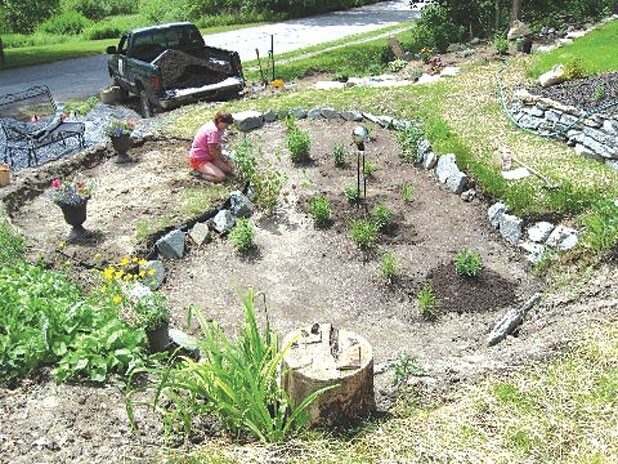 Let It Rain is one of two programs that reimburse owners of property in the Lake Champlain watershed for rain gardens. The other is Lake Champlain International’s BLUE program. Both offer on-site assessments to determine how best to mitigate a property’s stormwater runoff. Other “low-impact development” measures that may be reimbursed include installation of permeable driveways, green roofs and rain barrels. All these individual efforts help mitigate the damaging effects of heavy rain events, which can wash large loads of sediment, pollutants from cars and nutrients such as phosphorus directly into the waterways. More important, storm-water runoff from impervious surfaces causes stream erosion, according to Dan Albrecht, a senior planner for the Chittenden County Regional Planning Commission. This is especially true in areas with storm drains. When it rains hard, he explains, the water rushes off impervious surfaces, down storm drains and into pipes that dump into streams. About 40 percent of Burlington’s drains, for example, lead directly to outfalls on Englesby Brook, the Winooski River and the lake. “This creates impairment of the streams,” Albrecht says. “The streams become flashy, so it’s hard for biological communities — bugs and small fish — to establish themselves.” The large amounts of sediment washed into the lake can be even more damaging to its quality than are the particulates and nutrients in the water that emptied into the drains. Impaired streams are a particular problem in densely populated Chittenden County, where nine municipalities are subject to the federal Municipal Separate Storm Sewer Systems storm-water permit. Each MS-4 permittee must meet certain requirements to limit stream damage and engage the public in efforts to do so. (The feds recently added Rutland and St. Albans to the MS-4 list.) The CCRPC created the Chittenden County Stream Team to manage the public education and outreach component across eight of the towns as well as for three other permittees: the University of Vermont, the Vermont Agency of Transportation and the Burlington airport. 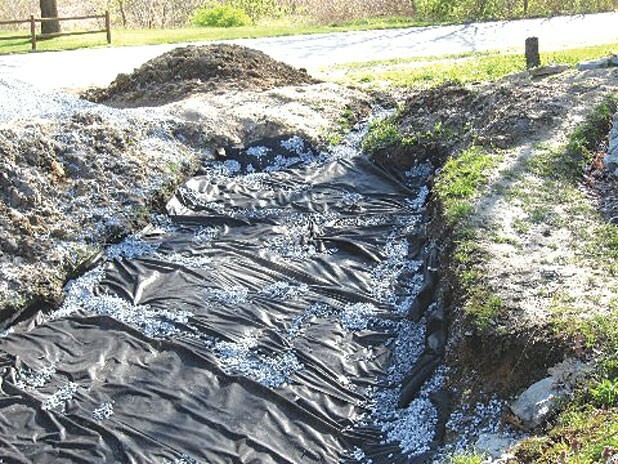 The WNRCD runs the Stream Team, spreading the word through workshops on everything from disconnecting your downspout (when it empties roof runoff directly into municipal drains) to best lawn-care practices for soil infiltration. The message about rain gardens is taking root. The South Burlington Community Library is installing a large rain garden at its entrance to filter parking-lot runoff. A rain garden on the greenbelt outside Green Life on Main Street in Burlington, created by the Lake Champlain Land Trust, has eliminated chronic flooding on the adjacent sidewalk. The Burlington Department of Public Works built a sizable one at the edge of Calahan Park. Now, a huge span of pavement and parking spaces drains, via a strategic curb cut, into a rain garden next to the jungle gym. Megan Moir, the DPW storm-water “plangineer,” designed the Calahan plot, as well as a rain garden in the Old North End and another near the Coast Guard parking lot. Moir says she checks on their efficacy by standing in front of them during a rain event. These gardens may look small, she notes, but they help. “We’re restoring [the land’s] natural hydrology,” she says. “Because we don’t have forests and fields like we used to, we have to take the little green spaces that we have and make the most of them. Brad Ketterling, an environmental scientist who lives in the Five Sisters neighborhood adjacent to Calahan Park, maintains the Calahan garden as a volunteer. “It’s not really that big a chore,” he insists, bending down to brush dead leaves from a clump of daffodils. Rain gardens require about as much maintenance as a perennial garden. Besides weeding and mulching, Ketterling “make[s] sure that the top layer of soil doesn’t get baked” — which would lead to more runoff. He spends about 10 hours on spring and fall cleanup and weeds on occasional evenings and weekend mornings through the summer. The Carusos are busy giving themselves more “therapy.” They’ve added a recirculating waterfall garden to one side of their rain garden, and they plan to install a ceiling fan in the gazebo they built on the other side. “It’s a work in progress,” Ron Caruso says with a smile. 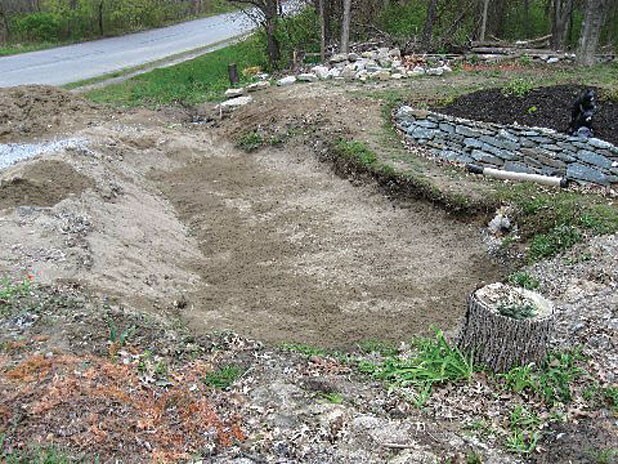 The Vermont Rain Garden Manual and information on reimbursements for rain gardens are available at letitrainvt.org. See mychamplain.net/blue-program for more reimbursement options. For calendars of storm-water-education events, see winooskinrcd.org and ccstreamteam.org. The original print version of this article was headlined "Super Soakers."